In small saucepan, combine beets and enough water to cover. Bring to a boil. Reduce heat; cover and simmer 8 to 12 minutes or until beets are tender. Drain. Rinse with cold water to cool. Meanwhile, in 1 1/2-quart glass bowl, layer broccoli, 1/4 cup of the salad dressing, yellow bell pepper, cooked beets, green bell pepper, onion and quartered artichoke hearts. Top with cheese. Cover; refrigerate 4 hours or overnight. Just before serving, top with remaining 1/2 cup salad dressing. To serve, use long-handled serving spoons to reach all layers. Canned diced beets can be used in place of the fresh beets. To reduce the fat in each serving of this salad by about 14 grams, use low-fat ranch dressing and reduced-fat Cheddar cheese. 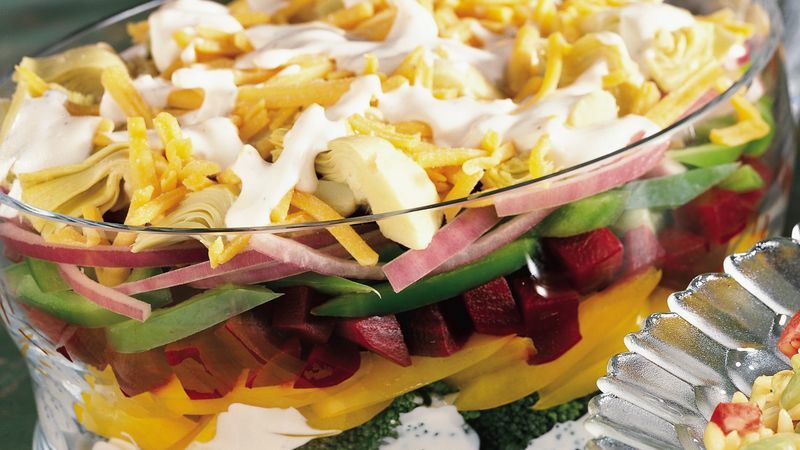 A clear, straight-sided glass bowl shows off the beautiful colors of this layered salad. Garnish it with sprigs of fresh herbs and red bell pepper cut with a small flower-shaped cutter.